A downtown Ottawa office building is getting a two-year makeover to accommodate a major new tenant, plus a re-allocation of some of the space on its lower levels. 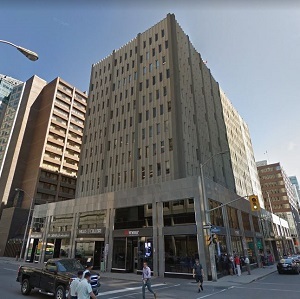 Nav Canada will move in to the Burnside Building at 151 Slater St., according to the Avison Young mid-2018 office report. Owned by Metcalfe Realty Company Ltd., the 12-storey, 147,000-square-foot class-B structure has already been vacated of previous tenants and work is underway. Michael Shore, Metcalfe’s director of leasing, said due to confidentiality clauses he is not able to confirm the identity of the tenant, nor any financial terms of the lease or renovations. However, he was able to discuss several other aspects of the project during an interview with RENX. “It was an opportunity for Metcalfe to relocate and upgrade space for some of its existing tenants in the building and, at the same time, decrease our vacancies (downtown) and do a new deal,” Shore said. “The building was ready for a renovation. The Burnside Building was built in 1966 by Thomas Fuller Construction Company Ltd. New life is being breathed into the building, in part, as a result of the city’s east-west light rail transit line, which is scheduled to go into service this fall. “(The) LRT coming through Queen Street and being near Slater and O’Connor helped secure the tenant,” said Shore, who has been involved with Metcalfe Realty for 29 years and is responsible for finding new lease candidates and developing the company’s portfolio. Nav Canada is the major service provider to Canada’s air navigation network, managing 3.3 million flights per year for 40,000 customers. To take on a large-scale, technology-dependent tenant like Nav Canada, Metcalfe will make significant changes to 151 Slater. Chief among them was finding new accommodations for the building’s 30 previous tenants, which included embassies, non-profits and engineering companies occupying from 500 to 5,000 square feet. They were given the choice of finding new space elsewhere, or moving into one of Metcalfe Realty’s other downtown properties. Shore said a majority of 151 Slater’s tenants agreed to deals that would see them fill vacancies in four other Metcalfe Realty-owned properties at nearby 116 Albert St., 85 Albert, 75 Albert and 130 Albert. Metcalfe is already proceeding with fit-up renovations for each of the tenants moving in to those buildings. None of the existing tenants at any of those properties will be affected, Shore said. Because the Burnside Building has traditionally hosted 30 to 40 tenants, rather than large clients which required significant floorplates, the building is being renovated and modernized with a completely new philosophy. “We’re completely redoing the building,” Shore explained. “We’re redoing the elevators, brand new mechanical systems, the facade and exterior walls are new. Basically, we’re converting it to a brand new building. The planned changes have various timelines. Modifications to the building’s exterior skin are expected to be completed in six months, but the overall renovations have a target completion time of two years. While Nav Canada will be the building’s largest tenant, it won’t be the only new resident. There will be a retail component to the remaining space in the building, which Shore believes will be attractive to restaurateurs and other types of retailers who stand to gain from the presence of a large tenant. Nav Canada will not only move into a building which will be modified to suit its needs, it will also be in the increasingly popular downtown core, conveniently located near bus transit and an LRT station. In a classic “win-win” scenario, Metcalfe Realty gets a large, blue chip client and is able to fill vacancies in some of its other downtown properties. Ottawa’s downtown office vacancy rate has plummeted during the past year, from 10 per cent a year ago to about 7.7 per cent at the end of Q2, as reported by Avison Young. Much of the influx has involved the highest quality buildings and renovations to existing structures, such as the former EDC Building at 230 Laurier St., where rapidly growing software giant Shopify has leased all 19 floors, and has begun moving into its 325,000 square feet of space. This activity, several major new builds in development, plus recent space reductions by the federal government, have caused concern among B-class and C-class building owners about the long-term viability of some of these properties. Therefore, the move by Metcalfe to gut and renovate to attract a major tenant isn’t surprising. In fact, it might be just the tip of an iceberg. Shore said the Burnside Building is Metcalfe’s only major redevelopment in progress. Editor’s Note: This article was modified to remove erroneous information about the ownership of Metcalfe Realty.